Troubleshooting Furnace, What Can I do? It can be very scary if your furnace won’t turn on, you run the risk of all sorts of secondary problems such as frozen water lines and condensation problems (not to mention it’s just plain cold)! We will help you step-by-step troubleshooting process that you should use when your furnace won’t turn on. Step 1: Check the Circuit Breakers. Start with the obvious first. 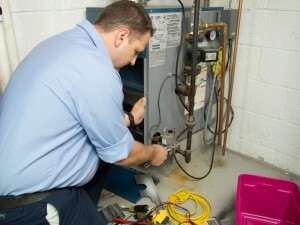 If there are other appliances not working, chances are your furnace isn’t the problem. You might have an electrical problem and you should call your electrical company. Next, check the circuit breaker for your furnace and other HVAC equipment. This is located in your electrical panel. Make sure they are all “ON” and have not tripped “OFF”. Some furnaces have an independent breaker that might look like a light switch right next to it. Other furnaces have a breaker on the furnace itself, like a switch that controls the power to it. Make sure that switch is on as well. Step 2: Check Your Thermostat. Confirm that the thermostat is receiving power to it. You should be able to read the temperature, time, etc on a digital thermostat. If you an analog thermostat, call me, we can upgrade that for you. Confirm that the thermostat is “ON”. Confirm that the thermostat is in , “HEATING” mode and not “COOL” or any other setting. 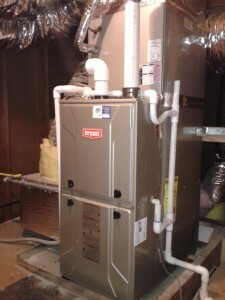 Step 3: Check the Condensate Pan of Your Furnace. If your pan has a drain, ensure that the drain is clear and condensate is flowing freely. If your furnace’s pan has a pump, it will have float switches. Ensure that the float switch is in the “down” position. If it is stuck “up,” it needs to be cleaned and tested for proper functionality. If it is stuck up with water in your pan, then you will likely need a new pump. Give us a call, we will help you with this repair. Step 4: Check Your Air Filter. A clogged air filter will cause a furnace to overheat. Your furnace will most likely turn itself off as a safety feature (much like newer vehicles or your kids Xbox). Replace your air filter with the appropriate size. If that does not help….you know our number. Step 5: Check Your Furnace’s Pilot Light. Some furnaces do not have pilot lights. If this is true for your furnace, move on to the next step. If you have a pilot light, welcome to Step 5. Gas or propane flow to this pilot light should not be interrupted. The slightest interruption can cause the light to go out and the unit will need to be relit. Many homeowners become nervous when relighting the pilot light. If you never done this before, I suggest calling in a professional to avoid accidentally pumping massive amounts of gas or propane into your house. Step 6: Check Your Gas or Propane Supply. If you haven’t given up yet…your next step is to check your utility supply. Confirm that your gas or propane supply has not been interrupted. Check the other gas or propane appliances in your home. If they are not working, contact your gas or propane provider to fix the problem. Step 7: Finally, Check Your Ignition Sensor. This is where it gets a little complicated. If you are new to this kind of thing, call us. We will show you how to complete is step safely. Your ignition sensor is a safety feature that tells your furnace whether or not If this gets dirty, it will not function and will require cleaning. It’s cold, and you are frustrated that your furnace isn’t working. The troubleshooting steps should help find the problem but if you are still reading this, chances are you need a professional, Give us a call 856-430-8452 and we will be more then happy to help you! Make sure you also check our Fall Maintenance Checklist so you’re whole house is ready for the cold.